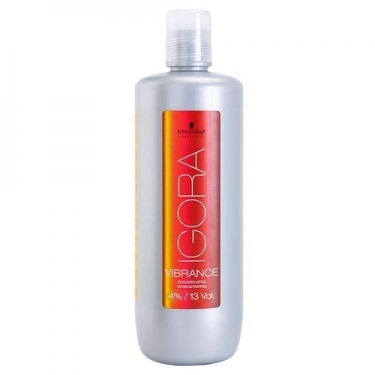 DESCRIPTION: Vibrance Developer Lotion 4% from Schwarzkopf is a developer of cream peroxide, designed especially for IGORA Vibrance. It has the perfect consistency and strength of the peroxide to offer the best color results when using Schwarzkopf's tone-on-tone color system. Leaves hair in great condition and easier to comb. Ideal for coloring darker hair and covering white hair.